Today, April 14th, is World Dolphin Day, an unofficial holiday that has existed since 1993 and which aims to raise awareness of the plight of the dolphin and the need to protect them. Dolphins have been and are deeply revered by many cultures and societies. In ancient Greece, they were sacred to Poseidon, Aphrodite and Apollo, and to harm a dolphin was punishable by death. They, along with fish, were also sacred to the Syrian goddess Atargatis, the first known mermaid. Several cultures, including ancient Greeks, Native Americans, the Dogon of western Africa, Amazon and Australian Aboriginal tribes believed that dolphins are reincarnated humans who chose to return to protect us, and some Aborigines claim direct descent from dolphins. Amazonian tribes believe the Boto, a river dolphin native to the Amazon and Orinoco tributaries, to be powerful shape-shifters that would seduce humans. To this day, as ever they did throughout our history, dolphins are known to be very benevolent and protective toward us. Ancient sailors soon learned to consider the mere sighting of dolphins to be auspicious, and countless are the stories of dolphins guarding humans from sharks, teaching and aiding humans in fishing, rescuing them from drowning and guiding ships away from dangerous shoals and reefs. As related in the two-part documentary “Conversations With Dolphins”, endurance swimmer Adam Walker took on the Cook Strait of New Zealand, “one of the hardest swims in the world.” Adam tells of his prayers to the ocean gods for something positive to happen during his undertaking and, soon after beginning the 18-mile swim, he found himself surrounded by a pod of dolphins. However, he also noticed that not too far behind was a Great White shark, clearly at least one reason why he found himself with such a fortunate entourage. Upon spotting the shark, Adam considered returning to the support boat, but the dolphins formed a barrier around him and soon the shark disappeared. He had chosen to focus on the dolphins rather than to give in to fear of the shark. The dolphins stayed with Adam for three hours, and it was only as soon as he thought to himself “Thanks dolphins, for the support, but I really must get on with the job at hand”, that the dolphins vanished from his sight. My husband and I watched this documentary recently and, upon hearing Adam’s explanation of his thoughts and the dolphins’ immediate departure, we decided that that was proof enough of what many have postulated about their immense intelligence and unique communication and behaviors – dolphins are psychic! Of all the things scientists know about dolphins, they still seem to be somewhat stumped when it comes to just how and why they often behave and communicate as they do. For me, the idea that they are genuinely, purely psychic fills in the gaps most satisfactorily. They are able to solve puzzles and appear to even be able to count, or at least easily and almost always accurately tell the difference between certain quantities (they even solved most of these faster than most humans can); they recognize their own reflection as most animals don’t, even primates, and they entertain themselves with their reflections; they are known to create and use tools, i.e. grasping little sponges in their front teeth to protect their sensitive beaks as they burrow in the rough seabed for hidden snacks; different dolphin species in different parts of the world indeed have their own distinct cultures and interactions with each other, as well as unique hunting techniques taught to younger generations; and they have a genuine language with which they can coordinate hunting maneuvers and even have their own unique individual names and calls. 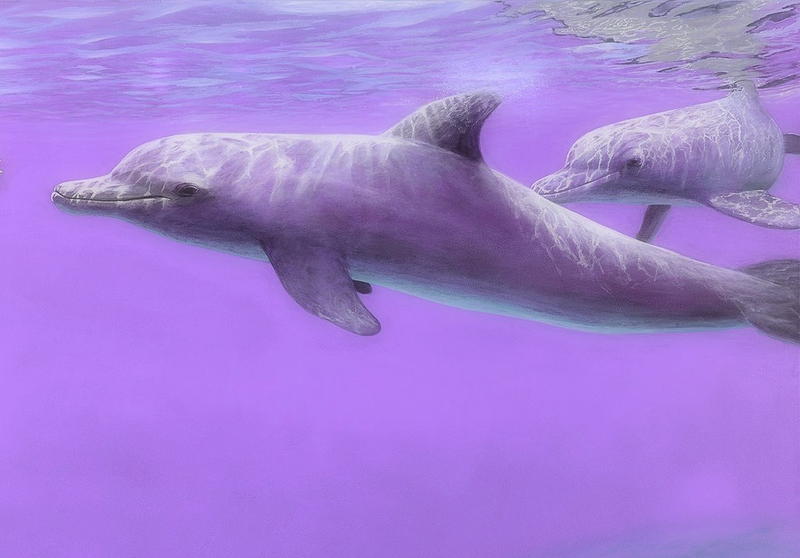 It is such a small wonder that, even since millennia ago, man has considered dolphins to be his oceanic counterpart, even the reincarnation of human souls that have passed on. Never in the history of the world has any kind of dolphin been known to attack a human, even if purposely provoked. It seems a dolphin will let itself be killed before it will harm a human. How then can we not love, revere and honor them, and protect them and their habitat? It is my opinion that they are not so much our oceanic doubles as quite literally our superiors. How can we not aspire to be more like them? Perhaps some of us, if we have evolved and pure enough souls, will return as graceful, powerful dolphins. We owe them so much for all the centuries of wonders and assistance they have given us. Enjoy this lovely video featuring the moving song The Dream of the Dolphin by music project Enigma, from their first album “MCMXC A.D.” Yes, it helped inspire this article! Haha, agreed! I had forgotten about that, but definitely loved it.